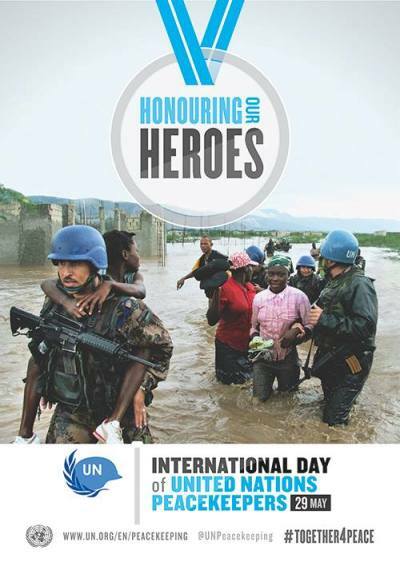 The International Day of UN Peacekeepers was established by the General Assembly in 2002 in tribute to all the men and women serving in peace operations for their high level of professionalism, dedication and courage, as well as to honour the memory of those who have lost their lives in the cause of peace. The Assembly designated 29 May as the Day because it was the date in 1948 when the UN Truce Supervision Organization (UNTSO), the world body's first peacekeeping mission, began operations in Palestine. The International Day of United Nations Peacekeepers falls on May 29, a day when the world solemnly remembers the blue berets who have made the supreme sacrifice for the cause of world peace — there have been 3,471 such bravehearts by last count. These bravehearts of different nationalities and cultures, donning different uniforms, were bound with a singular vision of dousing the fires in a land alien to them. They were unsung heroes in conflicts not of their making, where the sanctity and territorial integrity of their own motherland were not at stake — and hence the anonymity of their departure. Here are excerpts from a well-written article by Manmohan Bahadur in Daily Mail. He was in the IAF’s first UN mission to Sudan. India, a founding member of the UN, has been in the vanguard of peacekeeping right from 1950 when it contributed medical personnel and troops to the UN Repatriation Commission in Korea. There has been no looking back since and more than 2,08,000 Indian troops have donned the blue beret over the years. The Indian Army and the Air Force have been in the forefront and while the Army has participated in 49 missions since then, IAF contingents have won laurels in Somalia, Sierra Leone, Congo and the Sudan. In fact, Op Khukri, a joint air and ground mission launched in Sierra Leone in 2000 by contingents of the Indian Army and the IAF to free almost 250 UN troops held prisoner for months, is the stuff of legend and used as a model case study in UN training centres. Is the loss of human lives and expense of material worth the effort? Does India gain any tangible or intangible benefits from its contribution in the world of power politics? In yesteryears, by the theory of international relations, a country would be regarded as a ‘power’ based on its military capability; thus, the British Empire had its sea power and the Prussians their Army. The modern day has seen an expansion of the concept of ‘power’ to include soft power and an intelligent combination of the two, termed ‘smart’ power. While the US has hard military power and soft technological power in abundance, it has not succeeded in combining it smartly so as to be ‘accepted’ politically and socially as a benefactor in the comity of nations. The same possibly holds good for other Western nations too. India, on the other hand, lacks military power beyond a level but has an abundance of soft power capability. All these are in-built in a UN peacekeeping assignment and India’s active involvement, besides being an indicator of the nation’s altruistic intent, enhances its efforts to be accepted as an important player on the world stage. Indian troops are model peacekeepers and accepted as being neutral in their handling of warring factions. Peacekeeping missions have generally been in excolonial states where the legacy of their shackled past fosters a feeling of solidarity with Indian peacekeepers and enables amicable solutions through a combination of humane understanding and display of subtle power. Indian jawans are leading the pack, living up to the national ethos of peace for everyone. They deserve the world’s undiluted gratitude, says the author, a retired Air Vice Marshal, is a Distinguished Fellow at the Centre for Air Power Studies, New Delhi. A topic like this would never be complete without reference to the sad but strategic - Indian Peace Keeping Force (IPKF) performing a peacekeeping operation in Sri Lanka between 1987 and 1990. It was formed under the mandate of the 1987 Indo-Sri Lankan Accord that aimed to end the Sri Lankan Civil War between militant Sri Lankan Tamil nationalists and the Sri Lankan military. The main task of the IPKF was to disarm the different militant groups. The IPKF was inducted into Sri Lanka on the request of Sri Lankan President J. R. Jayewardene under the terms of the Indo-Sri Lanka Accord. The IPKF began withdrawing from Sri Lanka in 1989, following the election of the V. P. Singh government in India and on the request of the newly elected Sri Lankan President Ranasinghe Premadasa. The last IPKF contingents left Sri Lanka in March 1990 after bloody toil.